FileHippo Update Checker - Life just keeps getting easier ~ Android Forever! I wish all of life were this simple. 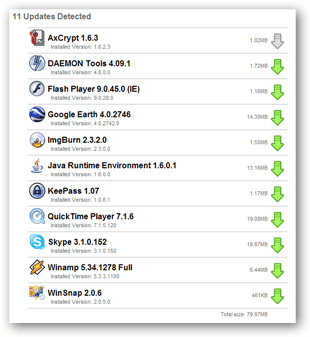 This little but powerful app scans your computer to see what versions of software you have installed, then checks FileHippo.com to see if newer versions are available. It then takes you to a special page on FileHippo that lists all the updates available, including beta updates. You can then click on any or all of them to get the updates. Sweet, huh?